It is tested time and again that faith is the strongest thing that can make mountains move. It can make all things possible we only have to believe it can happen. It's the only weapon we had when the head of our second child Gen (who was barely two years old then) enlarged and was believed to develop hydrocephalus. We didn't look to anyone but God only and His merciful grace that He will not let our child be afflicted with that sickness. The whole church had a group prayers in each location we reside and after three days the swelling of the head was gone. No treatment, no medicine but just prayers, faith and trust to God. It's a miracle that I'll forever share to everyone because in those moments of anxiety and fear God proved His love on us. 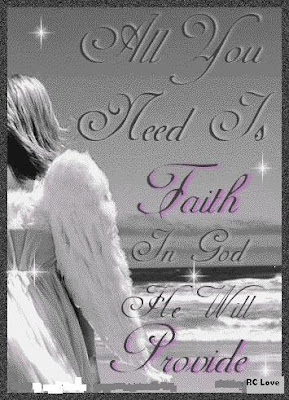 In life all you need is faith in God and He'll provide. Praises to Him.